We were soooo excited to be delivering a wedding cake to Houchins Farm Wedding Venue, Essex (www.houchins.co.uk) on Saturday 2nd July for Sarah and Paul’s wedding. It was the first time we had delivered there as it’s a fairly new venue but the buzz around the wedding industry is HUGE, so the chance to see what all the buzz was about was incredibly exciting. We certainly weren’t disappointed! The guys at Houchins have certainly thought of all the finer details and while I was working on Sarah and Paul’s naked wedding cake, Rob was walking around taking photos. We met the in-house florist, Anna, who was beavering away making beautiful vase arrangements for the tables and pretty floral touches outside where the happy couple were due to exchange their vows. It looked stunning. Sarah had chosen to have lots of summery, wild flowers which fitted in beautifully with the surroundings. This look was carried on over onto their wedding cake. Not only did I decorate the cake with fresh berries but Anna also supplied me with flowers too so once decorated their wedding cake looked absolutely gorgeous! To top their cake off, they had a cute black and white photo as their cake topper. The flavours they chose to have were lovely lemony lemon cake, Black Forest cake and zesty orange cake, all to be served as dessert (perfect wedding cake flavours for dessert!) I also made 20 dairy egg and nut free brownies for the children. Having your wedding cake as dessert is a great way to save a bit of money and also ensures that your wedding cake is all eaten. I often hear about how much wedding cake is left at the end of the day, which seems such a waste of cake. 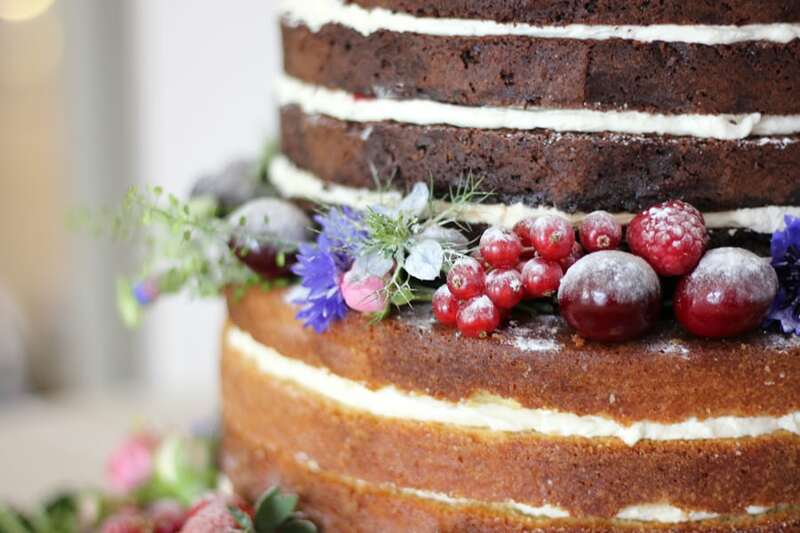 If you’re interested in having your wedding cake as dessert please get in touch at [email protected] or on 07746859488.